Tulumba is a Turkish dessert which is one of the most eaten sweets in Turkey and I must share it with you! Let me start with its name. Tulumba means pump, but I don’t have any idea why this popular Turkish dessert is called with this name. It could be because of the method it is made. It is squeezed through a piping bag with a star nozzle, you know we have water through force pumps with some effort. Just a guess! It is just another Turkish dessert with a weird name! Nobody cares the name of this Turkish dessert, tulumba here! We even forget the first meaning of its name, so when someone is talking about tulumba, it’s mostly about the dessert, not the pump. Tulumba is one of the cheapest desserts here, so everyone can buy it at any time. When people have occasions like weddings or islamic memorial ceremonies aka mevlit, they prefer to serve tulumba to their large group of guests. It is generally served on a plastic plate with some toothpicks so you don’t use fork, but you eat tulumbas with a toothpick. This is of course something for large occasions. We definitely have it with a fork or we just enjoy it with our fingers when we have it at home! Turkish dessert tulumba is a kind of fried dough soaked into syrup. Its dough is very similar to profiterole’s. The best tulumba is the fresh one, it must be crunchy outside and soft inside and when you bite it, you must feel the syrup absorbed inside. 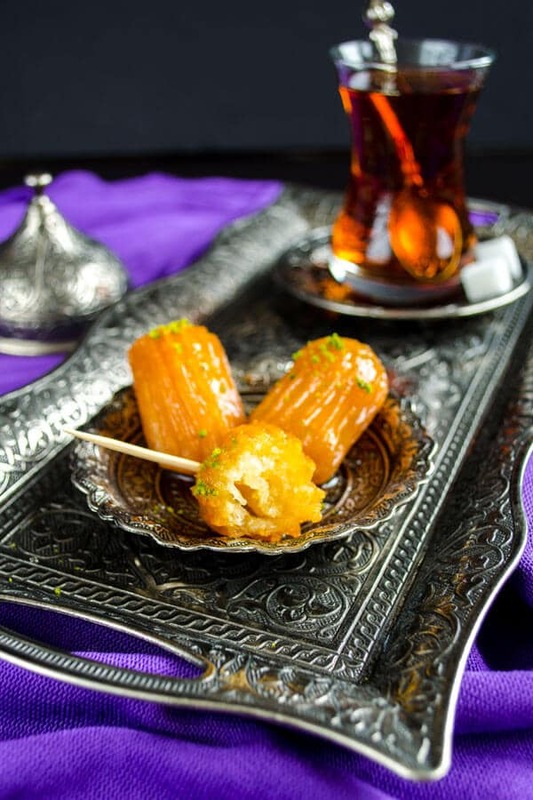 Tulumba is such a popular Turkish dessert that you can find it both in high class patisseries and in small shops. 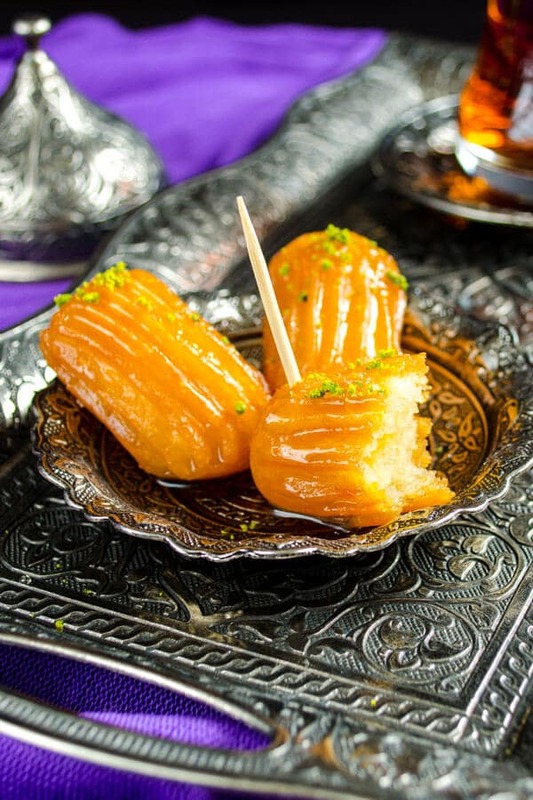 An important tip for making Turkish dessert tulumba is that you should throw them into cold oil, wait it to rise and then rise the heat slowly. You shouldn’t fry them in hot oil! Otherwise, inner side of them is not well cooked. Also, when cooking the dough, mix the flour mixture fast like we do when making flour halvah. There is a shop nearby and they just make tulumba, no other Turkish desserts, so they are very good at their job. When we want to serve tulumba to our guests, we buy it from this shop, so I don’t prefer making it at home. I got the recipe from them though, so that I can share it with you! Turkish Dessert Tulumba is a simple yet tasty dessert! Start preparing its syrup. Boil water and sugar and add lemon juice. Let it boil for 5-10 minutes more and let it cold. Put water and butter in a pot. Mix it well to melt butter in water. When it boils, sift flour and add it into pot little by little. Add salt and sugar and mix it fast with a wooden spoon until you have a nonsticky dough about 10 minutes over low heat. Take the pot from stove and let the dough cool down. Break eggs into it one by one and mix with your hands. Add in starch and semolina and continue mixing with hands until you have a creamy dough. Fill a frying pan with oil. Fill the dough into a piping bag with a star nozzle. Squeeze dough pieces into oil when it is still cold. Let them double size over medium heat, the slower they are fried, the crunchier they are. When they are fried, transfer them into cold syrup. Wait them in syrup for 1-2 minutes and take them with a slotted spoon. Before frying the rest of dough, let the frying oil cold and repeat the same steps. It doesn’t matter much. Either corn or wheat starch. I mixed the batter as said but the dough was watery is it 2 cups of water or 1. Thank you for the awesome recipe..only I worried when oil is cold..it absorbed in the food we are frying..in any deep frying method using oil..why not just “crust” with medium heat and do all the way slow frying…if we want double the size for crunch the Tulumba why not add in some baking powder..baking powder well in acidic egg mixture. Why we using semolina flour?..to hold the doubling size when it is cold?..thank you again your marvelous recipe..
To the moderator. Sorry, my mistake the recipe asked for 2 ½ cups of flour not 3 ½. My mistake. The quantity of syrup was still too much. Also note that when the mixture is placed in cold oil it sinks to the bottom and sticks, it is difficult to scrape sore dough off of the bottom without causing a sticky mess. It doesn’t float until the oil heats. I would like to hear from people that have also had this problem and how to overcome it. I tried this recipe and it is totally WRONG. You cannot mix 3 ½ cups of flour into 2 cups of water and beat briskly, you end up with a big gooey clump of dough after just one cup of flour that you would never be able to beat briskly. Also the quantities prescribed for the syrup is twice as much as you would ever need and when I was finished I tipped most of it down the drain and was a total waste. Increase the quantity of water for the dough to 3 ½ to 4 cups. Halve all the quantities for the syrup. I have just come across this fantastic sounding recipe and I can almost taste them and would like to make them, a couple of questions first. 1) What type of flour, plain or SR? 2) What type of oil for frying? #) And finally, appox how many will this recipe make? Hi Kim, use plain flour for this recipe. And corn oil or sunflower oil work fine for frying these.Well, I got the recipe from a tulumba dessert store , so I’m not sure about the amount. I can just guess that it makes more than 50 since these tulumbas are small. I wanted to make sure that it is 2 1/2 cups of FLOUR and 2 cups of WATER? Because if this is accurate, there is no way to mix it fast and for 10 minutes. It becomes so stiff right away? I have tried this recipe and they are delicious. lovely dessert and beautiful photo. I have a question about the frying method, don’t you think if the dough is fried in semi hot oil it will soak too much oil and turn heavy instead of being soft and fluffy.. maybe he meant on low heat so the inside will cook at the same time with the outside before you turn the heat up. Hi Arlette, it’s important that the oil must be cold when you squeeze dough pieces into it. Then turn on the stove, both the oil and tulumbas inside it start to heat at the same time this way. And fry them over medium-low heat. This makes it crunchy outside and soft inside. I made this today using this recipe and it tasted like eggs. i love these, they have them in my home in kurdistan but this had too much of an egg taste to me. That’s interesting. Could it be because they are not combined well? Maybe the eggs you used are larger, then you can use 2 eggs instead. Interesting that you add semolina at the end. Does it help make it crunchy? Also what kind of starch do you use? Hi Faye, semolina cooks faster than flour and adding starch and semolina later helps the dessert get puffy. You can use either wheat or corn starch, both work fine! Saw your beautiful pictures on Pinterest and arrived here on your blog for the first time today. I’m wondering how you achieved the yellow color – was it because of the eggs? Thank you Stacy! You have fantastic recipes on your blog too! Your panda cookies definitely rock! Zerrin this dessert Tulumba sounds very tempting. I need to try one when I can. The aspect is similar to churros from here (filled them with chocolate or dulce de leche)….. those pics make me hungry for something sweet and soon! Hi Gera! How are you doing? Nice to see you here again! I’ve heard churros before but didn’t know what kind of a food it is, thanks for informing. Our tulumba is like the plain version of churros, can’t imagine these are filled with chocolate! Sounds heavenly! I want to taste this lovely dessert! The syrup coating sounds delicious. Hi Lisa! Nice to see you here again! This dessert is definitely addictive! I love the crunchy sound it makes when you bite it! The way you describe them makes them sound so delicious Zerrin! Plus your pictures are stunning! I never saw this method for frying before – it’s very different. That frying method was new to me too! I was surprised when the man in tulumba shop told me to start to fry them in cold oil. Then he explained that it is the most important tip for making tulumba dessert right way. Thanks for the recipe! This is a treat I adore. Your tulumba look perfect and extremely tempting.